20130331 - Up in the am and to church. It was a really good service, the best I have been to in months, even if the 735 trumpets deafened me, but that was a plus because it prevented me from listening to to the pastor's mono-song liturgy. But honestly I did like the message very much. 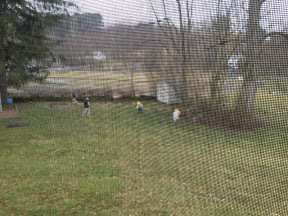 Back to the house for a big Easter egg hunt (D hid them, not participating this year, except the candy eating part). Gma&paW came over for a nice lunch. D&I headed to New Philadelphia to meet a girl that makes jams and pickles to put on our site. We got back to Gma&paB's and hung out, the rain lifted, the kids played and played and we had a good time. We headed home and the boys passed out. Home and getting ready for a big week.